Our Company is incorporated in Cusco providing all tours available in Cusco, Arequipa and Puno. Our core purpose is to provide the best value travel packages. Make this trip uniquely yours by working with our experienced staff picking the best package or designing your own, selecting great accommodations, including special interests , and creating priceless memories of a problem – free South Peru holiday. Why are our prices far lower than other Travel Agencies? 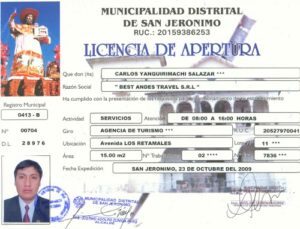 Thus is created Best Andes Travel – as a deep and true reality, as an extraordinary tourism proposal, besides our Classical Tourism offers: this is ALTERNATIVE TOURISM. We have tried to show – in each of our programs – something of the Andes of Peru, of its people and its land, combining the incomparable beauty of our landscapes, the depth of our traditions, the warmth of our people and the knowledge of nature, with modernity and qualified services, obtaining by this way, unique products, highly competitive on a commercial level and with services of an impeccable category. Best Andes Travel is Your better option for visiting Peru, whit us You wil be very happy and this Its Your Oportunity for to Know Cusco, Machupicchu Cusco, Pisaq Cuzco, Cuzco Ollantaytambo Perú, Chinchero Cusco, Cusco Maras, Moray Cuzco Peru, katedral of Cusco Peru, Koricancha in Cuzco, Sacsayhuaman in Cuzco Perú, Qenqo Cusco, Cusco Pucapucara, Tambomachay Cusco Peru, Inca Trail to Machu Picchu, The Jungle in Cusco, Manu Cusco Peru, Puerto Maldonado Cusco Peru, Rafting in Urubamba river in Cusco Perú, Arequipa the Colca Canyon, Arequipa City, Uros Puno, Puno Taquile, Sillustani Puno Peru, Raqchi Cusco Perú. 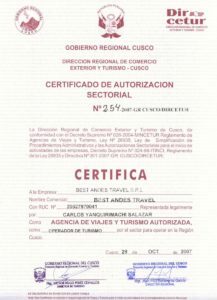 Now, I just have to welcome you to the Best Andes Travel, hoping that our programs will satisfy every single wish and requirement, in the absolute belief that, at the end of your trip your passengers will feel enriched and joyful; and that you will know, like us, that Peru is indeed, an unforgettable destination. 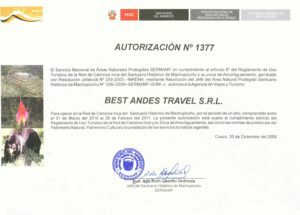 WELCOME TO BEST ANDES TRAVEL….ENJOY IT! Registered as Tourist service providers.